Crashing a Republican Party (Ftrain.com) . Wandering into the Republican Governor's Association event. A party! We grabbed our cameras, and ran downstairs to meet Amelia. She gave us each a neck tag. We hung the passes around our necks, but then took them off. The party itself was three blocks away, at the Fulton Ferry landing. There was no reason to be Republicans until we absolutely had to. I read my pass out loud as we walked. “This party is presented by the Republican Governor's Association, and it is called 'A Brooklyn State of Mind',” I told Steve. “It features the music of Arkansas Governor Mike Huckabee (R., bass) and his band Capital Offense, and is sponsored by Keyspan Energy, the American Gas Association, and Constellation Energy. As well as Entwistle and Capucci, LLP, whoever they are.” (It turned out that they are Enron's lawyers.) At the entrance, there was no cavity search, just an intern. He waved us through. “Have a good time,” the intern said. It turns out that a Republican Party looks like the Republican Party—lots of suits and boat-tan, with a certain blanched, homely quality—office park chic. 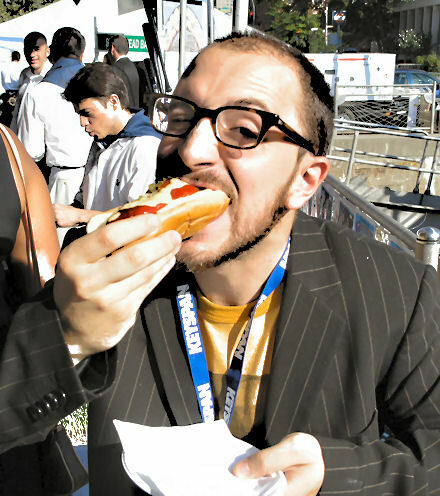 The event itself was Brooklyn-in-quotes, the Borough of Kings reinterpreted as a food court. You could go to the “Sheepshead Bay” stand and get a shrimp salad sandwich, or to “Coney Island” to get a hot dog. (Not represented: Red Hook, Flatbush Ave., and Williamsburg.) 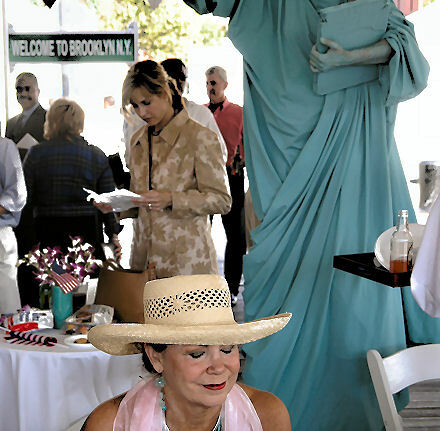 The Statue of Liberty, on stilts, ate cotton candy. A police boat stood guard in the harbor, and numerous dark-suited men with ear-bud headphones looked us over. “That's a 'Sausage of Freedom',” I said. 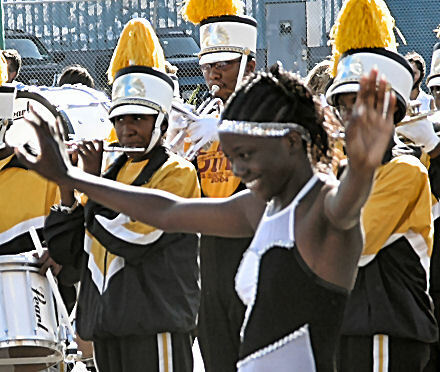 A marching band, all African-American teens, filed in and dutifully began playing. The Republicans mostly ignored the band. The band's second song was “What's Going On” by Marvin Gaye. As the sousaphones tooted, I recited the lyrics to myself. A few Republicans watched the band, amiable, smiling, sipping wine. “The band knows, right?” I said. “They have to know,” Steve said. “They're ten feet into Brooklyn,” said Steve, “and they've turned it into a mall for their own comfort.” A water taxi pulled up and disgorged a gaggle of Republicans. As we walked out, Gov. Huckabee's band played “Sweet Home Alabama.” Steve groaned as if he'd been punched in the stomach, and doubled up on the sidewalk. I helped him up and put my hand on his shoulder, and asked if he was okay. “The guitarist was playing with his teeth,” he said. “Maybe they'll lose,” I said. A few hours later, I went over to my girlfriend's. With her best friend, she was making cupcakes for her roommate. Her roommate had been arrested on Tuesday night, and was still in custody. He had just been booked. He'd been helping out with an activist marching band, and the police had come with the net-fences and plastic cuffs. 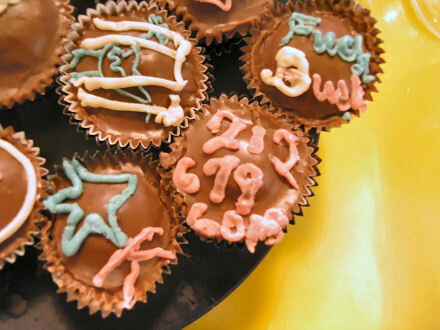 The cupcakes were decorated with protest signs, prison bars, a lawyer's phone number, and files and saws (to saw out of prison), and with a bird, to symbolize freedom. Taken together, the dozen of them told the story of his protest, arrest, and release. The guy should get out of jail late tonight, after the convention. I'm sure he's looking forward to it. As George W. Bush often says, in a very different context, freedom is a beautiful thing. This is Crashing a Republican Party, an essay by Paul Ford, published Thursday, September 2, 2004. It is part of Walking/Riding, which is part of Semiautobiography, which is part of Story, which is part of Ftrain.com.